Today, we have monkeys with brain interface control systems. Tomorrow? Maybe mind-controlled exoskeletons. 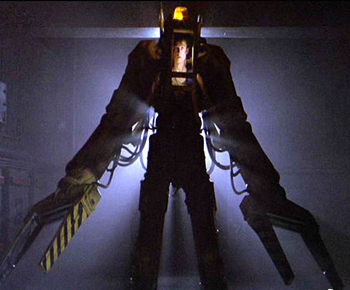 For the past couple of decades, practical exoskeletons have been the stuff of sci-fi movies and novels. However, a new study by neuroscientists shows some surprisingly cool possibility for mind-control interfaces, and the folks involved have actually gone and mentioned the possibility of using this technology with exoskeletons. Scientists at the University of Chicago have revealed that a series of experiments with monkeys proved that brain control interfaces were effective at controlling computer cursors. However, the monkeys learned how to use this system much faster when they were moving their arms in the movements one would normally associate with such actions. This, in turn lead to the exciting prospect of mind-controlled exoskeletons in humanity's future. [Lead researcher Nicholas] Hatsopoulos said his group's findings may pave the way for enhanced brain-controlled devices that include multiple forms of natural or even artificially produced sensory feedback. "Wearable exoskeletal robots could provide sensory information to patients with full or partial feeling," he said. "Alternatively, direct stimulation of the relevant area of the cortex could be used to replicate sensory feedback in patients who have lost both motor and sensory function." What this means is that basically we've already got the technology to create mind-controlled exoskeletons - we just need to develop and refine it. I was particularly intrigued by the idea that we don't need to move a person's limbs to give them motor feedback - just stimulate their motor cortex. Once we've mastered that, how far are we really from Robocop, whose brain has been hooked up to an almost entirely artificial body? Exoskeletal robots to help patients in need is certainly a noble idea, but I can't be the only one who's thinking about the potential superhero applications for such a device, right? Well, that and the ability to take on giant Xenomorphs while shouting memorable catchphrases.